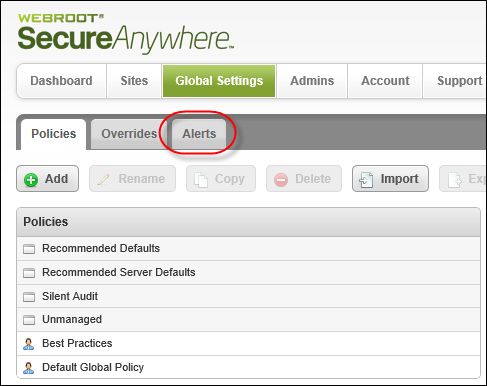 You can now create alerts at the global level, which reduces the maintenance overhead as these can now all be handled from one shared location instead of having to manually manage individual site alerts. 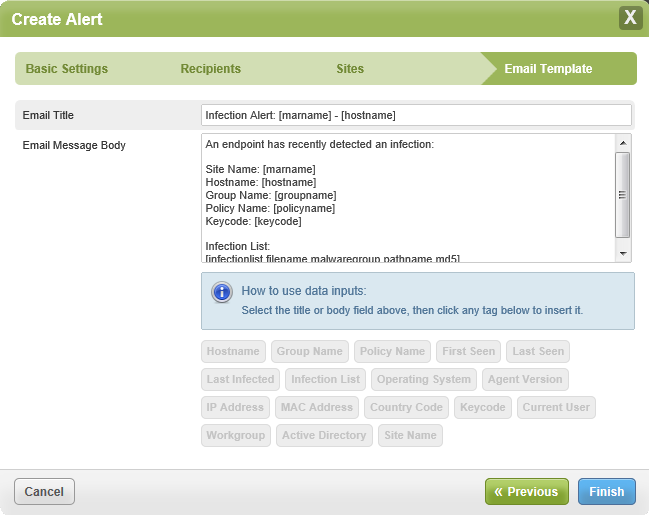 Alerts can now be set up and managed centrally by selecting which type of alert you want to send, either Infection Alert, Installation Alert, Infection Summary, or Installation Summary, along with the frequency at which these alerts should be sent. You can then apply alerts to any child endpoint protection site. From the Site console, click the Global Settings tab. The system displays the Global settings panel, with the Policies tab active. The system displays the Alerts panel, with the Alerts List tab active. The system displays the Create Alert window. Accept the system-generated name for the alert. Enter a new name for the alert. The system displays the Recipients panel. If you selected Create New List, do both of the following, otherwise continue with the next step. In the Distribution List Name field, enter a name for the new distribution list. In the Email Addresses field, enter the email addresses for the recipients of the new distribtuion list. From the Select a distribution list drop-down menu, select from any of the distribution lists you previously created. For more information, see Creating Distribution Lists. The system displays the Sites panel. The system displays the Email Template panel. In the Email Title field, enter a name for the email. In the Email Message Body field, enter the text that you want to send. To use Data Inputs, place the cursor in the text, then click any of the tags to insert the data input at that point in the text. When you're done, click the Finish button.